Love everything <3 btw what lipstick brand are your wearing? love this post ! great cosy outfit and photos! Except you didn't have a bad hair day. Just kidding. Beanies have never been my thing but this year I see so many intresting ones that I want to give it a shot..specially after looking at how you rock it, I am going to get one.. I love this perfect black outfit, you look stunning! Wow, ce draguta e tinuta asta! Caciulita e superba! Love your bad hair day solution Sorana ;-) Great look, love the complete outfit, you look chic and casual at the same time. Cat de bine iti sta cu genul acesta de fesuri, merita sa le porti cat mai des! O saptamana splendida iti doresc! Adorable post if you want visit my fashion blog!!! I love your all black look hun! Great beanie, such a great addition to the whole look! Foarte frumoasa toata tinuta si caciulita e draguta ,si eu apelez la ele mai mereu pe timp de iarna cant parul meu sta in vreo 50 de directii orice i-as face. Love how it gives your outfit an effortlessly cool vibe! da da da, si eu le ador, salveaza o bad hair day :)) ce binte iti sta cu rujul asta! A bad-hair-day gave you the chance to create a really cool look. I totally like it. Nice outfit! Loved the beanie cap! Just saw it on another outfit post. I love the all black combination! for me it's everyday a "bad hair day"!!! ihihihih!!! lovely outfit! You look fierce in all black! I'm loving the leather! Have a lovely start to your week! Mai port si eu, dar de cand m-am tuns scurt ma obisnuiesc cam greu cu felul in care arata pe cap. i love this, i love black! and the lipstick is gorgeous!! Acabo de descubrir tu blog gracias a Instagram y me encanta, te sigo desde ya! love the layers and all black! 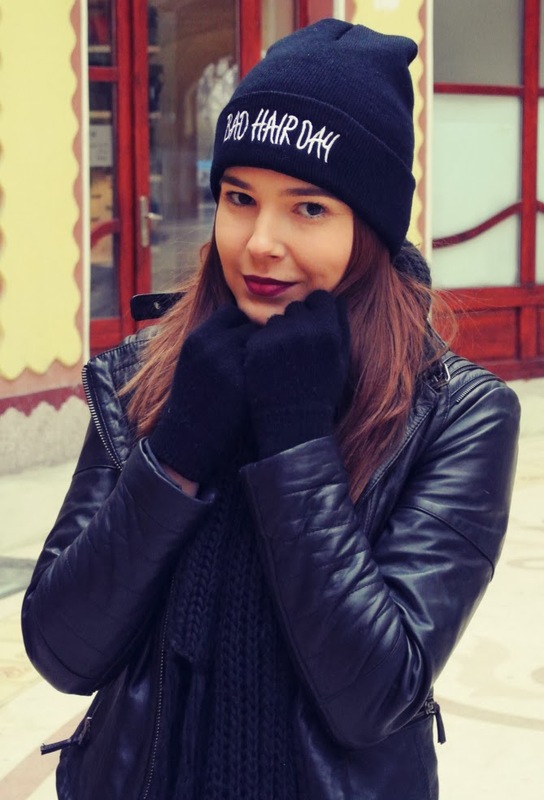 Very elegant all black outfit, such a cute beanie! I am so grateful for your insightful comments. Have a great week ahead hun! Maybe will follow each other? You look beyond gorgeous, love your outfit!